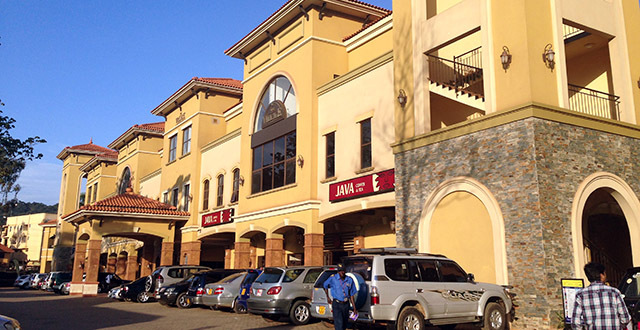 Malls are springing up all around Kampala. These mega structures are filled with soaring pillars, expensive molding, tile floors, and well lit shops. We’ve seen the construction but rarely have we actually experienced the finished product, until now. With the recent opening of Village Mall, we have a chance to see what these sleek new shopping centers are like in action. Boasting a Nakumatt, cosmetic shop, computer stores, a food court, and of course, KFC, this new mall has become the place to come and explore. Strict security greets you at the gate; however the actual security around the mall is fairly inconspicuous. As you walk around the wrought iron and neutral stone laden behemoth it’s hard not to feel impressed. Open air courtyards filled with foliage and seating creates a sprawling atmosphere that seems almost too luxurious. But of course, I’m a little past that age of just ‘hangin’ at the mall, so what about the shops? Well the Nakumatt there is easily accessible and laid out well. A Cayenne Express in the back gives you fast pizzas, chicken and chips, and a variety of other treats. Just around the side a glass case offers cakes, pies, and numerous pastries. Upstairs, a food court has a couple different restaurants to choose from. Everything from Chinese food to Indian, to local dishes are offered. Among them are some of Kampala’s favorites with Olives Pizzeria and China Bowl standing tall. Then of course there is Paradice. An ice cream shop that makes the best sherbet I’ve ever had in Kampala. I’ve sampled the ice creams around town (in depth reporting just for you) but this one has to be the best I’ve had so far. Now, I know what you’re waiting for. KFC. Let’s take a minute to talk about this very first ever KFC in Uganda. I’m not going to lie to you: that chicken is damn good. Delicious, in fact. The mashed potatoes are creamy and the chips are crispy. It is a solid recreation of an American classic. That said, it is also damn expensive. A 21 piece bucket will run you around 99,000 UGX and while smaller individual meals stay in the 20-30,000 UGX range, it is still not quite the deal many of us are used to in the USA. But it is efficient, well run, and, if you don’t mind dropping that kind of cash on fried chicken, it certainly lives up to its reputation. Now let’s shift away from eating (why? I know, but we should try for at least a moment) and talk about the other shops located at his sparkly new center. A dry cleaners and cosmetic shop will help keep those suits pressed and make sure you smell good while doing so. Apple supplier, Elite Computers, will make sure you’re in business. And a host of other cellphone and technology centers will keep you connected. In addition, craft stores and clothing shops will make sure you can keep your home and closet nicely furnished. Now the 2nd floor of Village Mall remains a mystery as work is still ongoing there so no shops have moved in quite yet. However, with construction set to wrap up soon, it will be interesting to see what arrives. Oddly enough, the mall has yet to see the usual banks and ATM cash points that are so common in other shopping centers around town. However, no doubt those points will arrive given due time. Now full disclosure time: I’m actually not that fond of malls. I usually find them too busy, too bright, and too expensive. That said, Village Mall does bring some much needed options to the Bugolobi area. And the soft, modern interior keeps it from feeling too much like some relic from the 1990’s. So go try some ice cream, save up and get a bucket of chicken, and get your weekend shopping all in one trip. Because these modern malls are making their move on Kampala’s skyline, so we might as well take full advantage of them.